"สิ่งที่เกิดขึ้นถือเป็นปรากฏการณ์ครั้งสำคัญที่เชื่อได้ว่าทุกพรรคการเมืองนั้นจะต้องกลับไปคิดทบทวนในทุกเรื่องใหม่อีกครั้ง จากนั้น 3-4 วันเราจึงจะทราบว่าแต่ละพรรคการเมืองนั้นจะมีท่าทีอย่างไร ซึ่งพรรคเพื่อชาตินั้นชัดเจนแล้วว่าไม่ส่งผู้สมัครในตำแหน่งนายกรัฐมนตรี แต่ส.ส.ระบบเขตนั้นพรรคมีการส่งผู้สมัครครบทุกเขต"
ANALYSIS—The apparent political deal to end the decade-and-a-half long red-versus-yellow conflict in Thailand has unravelled within hours, with King Vajiralongkorn making a televised statement that it is inappropriate and unconstitutional for his sister Ubolratana to be a prime ministerial candidate. It had seemed inconceivable that the Thai Raksa Chart party, one of the political vehicles of exiled former premier Thaksin Shinawatra, would make a deal with Ubolratana to be their candidate for PM without getting approval from Vajiralongkorn. But in his statement, Vajiralongkorn implied that she had been acting on her own initiative without his blessing. Today's extraordinary events have now taken an even more dramatic turn. Royalists who had been appalled by the prospect of a political deal with Thaksin are now rejoicing, while Thais who believed the deal heralded an end to political conflict are heartbroken. It remains unknown if the royalist elite and junta have somehow managed to intervene and persuade Vajiralongkorn to reconsider, or if he really was not consulted about his sister's plans in advance. Political tensions in Thailand are now at fever pitch. The country faces significant chaos and uncertainty in the run-up to elections on March 24 and the coronation in May. 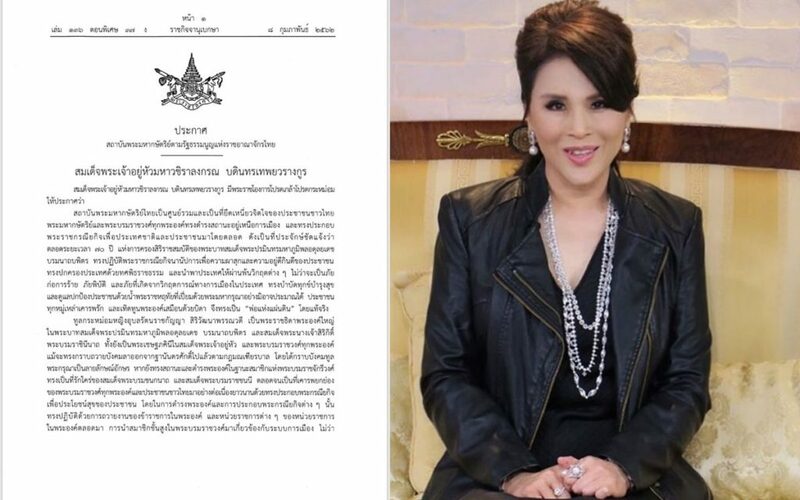 The nomination of Princess Ubolratana as the prime minister candidate of the Thai Raksa Chart party is a momentous development which will cause a dramatic realignment of Thai political forces. There are dangerous days ahead. Thailand is in uncharted political territory.